I was pulling a sweater on this morning and I found myself annoyed with the damp weather and all the talk talk talk on the radio when I just wanted some music that would put me in the good mood on this dreary, cold, April day here in Seattle. Not only was the talk talk talk and all the radio spots (ads) annoying but the morning jocks were talking about their impending divorce which was of course, sad. This was followed by a song about a girl done wrong. I realized that this was not how I wanted to start my day. What if I created a playlist that encouraged a happy, sunny, positive feeling? Could it make me feel happy and even get me out of a foul mood? I started thinking back to songs that actually made me happy. Songs that my best friends and I played over and over again when I was twelve or made me feel like I was driving top-down on a sunny Saturday summer morning. Since this is the happy girl experiment I'm going to listen to a new song each morning. 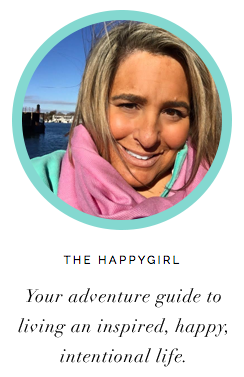 It may seem like a little thing but The Happy Girl Experiment is about little steps that will hopefully all roll into the happy I want back in my life. Maybe for you too it will shake loose those nervous vibes about a meeting coming up or a medical test you're taking or the bad dreams from the night before. Even if it is just for three minutes, allow yourself those three minutes to stop obsessing about what is making you so unhappy or angry. Give your mind a reprieve. Listen to the lyrics, allow them to move through you for. just. three. minutes. I knew we had to start with a classic and it doesn't get any better than Frank Sinatra's "I've got the World on a String." I ran downstairs and found it in our music library and yes, I turned it to 11 :-) I closed my eyes and it made me forget what I was so upset about even if it was for just a couple minutes. It was a sweet nap for my brain. See how it makes you feel and if you have a song that just makes you feel good, send it to me!